Two new fire books has been recently published! And both have a global and interdisciplinary perspective. The first is edited by Claire Belcher (2013; ), and each of the 16 chapters is a scientific article written by different specialists (a total of 25 different authors, many of them from UK institutions); it includes few colour plates. As the publisher says, “the book shows how knowledge of fire phenomena and the nature of combustion of natural fuels can be used to understand modern wildfires, interpret fire events in the geological record and to understand the role of fire in a variety of Earth system processes ”. This book has perhaps little on fire ecology, and it is more focussed on fire history at the geological scale, combustion details and atmospheric impacts; all these topics are important for understanding fires at the global scale. The second book (Scott et al. 2014; ) is a full-colour textbook on fire written by five authors (two of them had also participated in the other book). This is probably the first general textbook on fire science ever published, and as such it covers all topics related to fire although with relatively little depth. Thus it provides a summary of the current knowledge on fire at a global scale. In the words of the publisher, it “is designed to provide a synthesis of contemporary thinking; bringing together the most powerful concepts and disciplinary voices to examine, in an international setting, why planetary fire exists, how it works, and why it looks the way it does today”. Belcher, C.M. (ed) 2013. 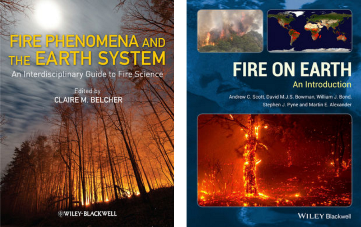 Fire Phenomena and the Earth System: An Interdisciplinary Guide to Fire Science. Wiley. Scott, A.C., Bowman, D.M.J.S., Bond, W.J., Pyne, S.J. & Alexander, M.E. 2014. Fire on Earth: An Introduction. Wiley.